Many correctable vision problems are caused by abnormal eye anatomy. Most people do not have perfectly shaped eyes that allow them to see perfectly. Almost everybody has some degree of abnormal curvature or other anatomical irregularities that cause slight visual changes. Astigmatism is a common form of visual impairment that results from irregular anatomy. The clear front area of the eye is called the cornea. This area refracts light rays and directs them onto the retinal surface. The rays then pass through the cornea onto the lens. Due to its flexibility, the lens is able to change shape and focus the light rays more precisely so as to ensure that they hit the retina. Light must bend at a specific angle so that you can see clearly and with good focus. If there is an abnormality in your eye structure, light will not focus properly on the retina, and your visual sensory cells will not be able to process the images correctly. Astigmatism occurs when there is abnormal curvature in either the cornea or the lens. It is important to note that, since ocular structures are hardly ever perfectly shaped, most people have a certain amount of astigmatism. When the cornea or lens has extremely curved, however, light rays fail to focus onto the retina. This leads to blurry vision, no matter how far away you are from an object. Many people who are farsighted or nearsighted also have some degree of astigmatism. When you see your eye doctor for a comprehensive optometry exam, a check of your eye anatomy and vision will be done. Almost everyone will have some problems clearly reading letters on a distance chart. Your test may also include the use of a keratometer, which will measure the curvature of your cornea. You have probably had a bright light directed into your eyes during an exam. By measuring the light’s reflection on your cornea, the eye doctor is able to assess the curvature. He or she will also ask you to look through several different lenses, which determines if you have a refractive error and to what extent. Often, treatment for astigmatism will consist of prescription eyeglasses or contact lenses. As an alternative, your eye care provider may give you a series of rigid contact lenses for you to wear for relatively short periods of time. This is called orthokeratology, and the different lenses will reshape your cornea, allowing you to have clear vision. 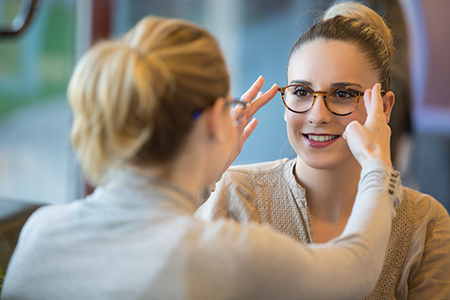 While orthokeratology does not permanently change the shape of your cornea, you may be able to do most everyday activities without corrective lenses as a result. Surgery is another option for those who want a more permanent solution.